The independent counsel team looking into a massive opinion-rigging scandal will summon South Gyeongsang Province Gov. Kim Kyoung-soo again for questioning. The independent counsel team said in a press briefing Tuesday that it has not completed its investigation of Kim, who is suspected of colluding with a power blogger nicknamed “Druking” to manipulate internet comments in order to sway public opinion in favor of the ruling Democratic Party of Korea. On Monday, the team led by special prosecutor Huh Ik-bum conducted a marathon questioning of Kim. Kim is reported to have denied all allegations against him during the 18-hour grilling session. He appeared at the independent counsel team’s office at 9:30 a.m. on Monday and returned home at 3:50 a.m. Tuesday. Earlier in the morning, special prosecutor Huh had hinted that the team may summon Kim again if needed. But Huh was cautious about whether the team was reviewing the option of requesting an arrest warrant. Investigators believe Kim is an accomplice of Kim Dong-won, the power blogger, who is currently standing trial under detention over several charges, including the opinion-rigging scheme. He claims Kim Kyoung-soo had ordered the campaign. 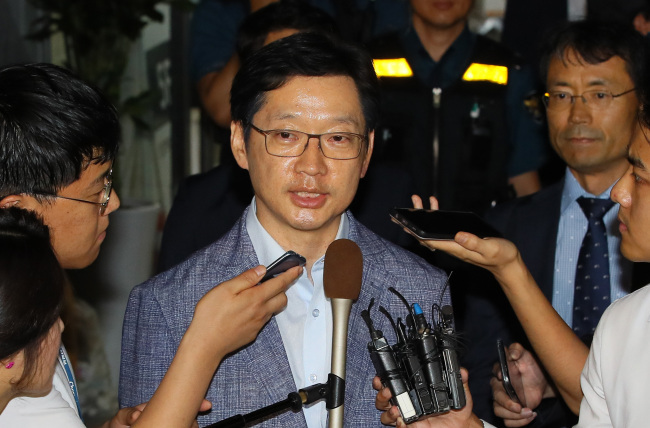 The South Gyeongsang Province governor is also suspected of violating the election law, allegedly asking Kim Dong-won for help in the June 13 local elections, in which he was elected the governor. The governor is accused of promising Kim Dong-won’s associate a consular representative position in Japan for his help. Before the launch of the independent counsel team, Kim Kyoung-soo was questioned by police as a witness on May 4. At Monday’s questioning, however, the special prosecutors summoned him as a suspect.